Plow angle can be adjusted up to a maximum of 45 degrees to the right or left. Clearing width can be adjusted to 980 – 1400 mm according to the plow angle. Plow wrist angle can be adjusted between -1.5 and 70 degrees. 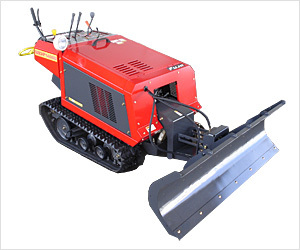 Since the adjustment can be done simply by operating the lever, the Snow Plow enables you to remove snow easily even from rough areas. You can move the plow part up and down to dump the removed snow by operating the lever. The maximum lift height is designed to be as high as 800 mm for easy loading of light trucks with removed snow. *The specification and appearance may be revised for improvement without notice.